L to R: Cole Eunson; Ellis Jones; Gerald Footman; Charles Miller, Fox Music House; and Joseph Fox, Fox Music House. "Hundreds . 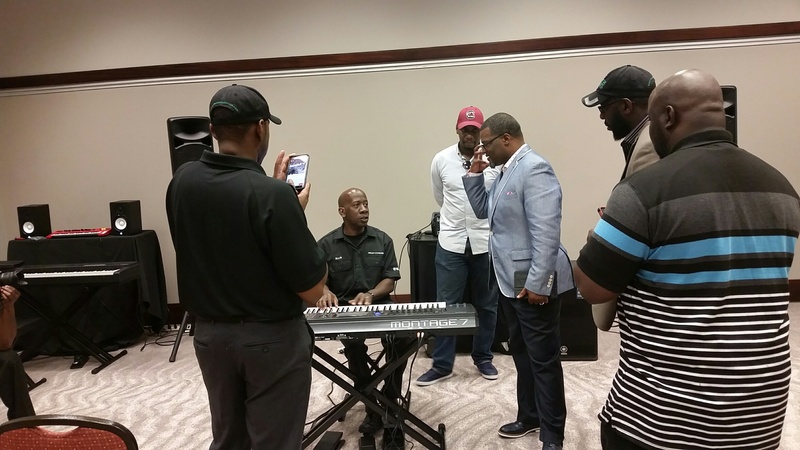 . . attended our first Music Ministry Summit: all of them appreciated the Yamaha commitment to help them to powerfully engage their congregations through high quality music performances,” said Cole Eunson, Yamaha. The McDonald’s Choir Showcase focuses public attention on the expression of faith through music and song. This year, the 9th annual showcase was held on May 6-8, and the format expanded to include two days of sessions with regional music ministers and musicians prior to the popular choir competition on Sunday evening. Working in tandem with Fox Music House in Charleston, Yamaha contributed workshop session leaders, musical instruments and equipment for performances, awards to the top choirs – and debuted the next generation of Yamaha synthesizer, the Montage. On Friday and Saturday, Mike Overlin, manager of worship resources, and John Schauer, Pro Audio product manager, YCA, conducted two days of seminars and hands-on workshops with music ministers featuring the Yamaha PA system and the new TF3 digital mixing console. 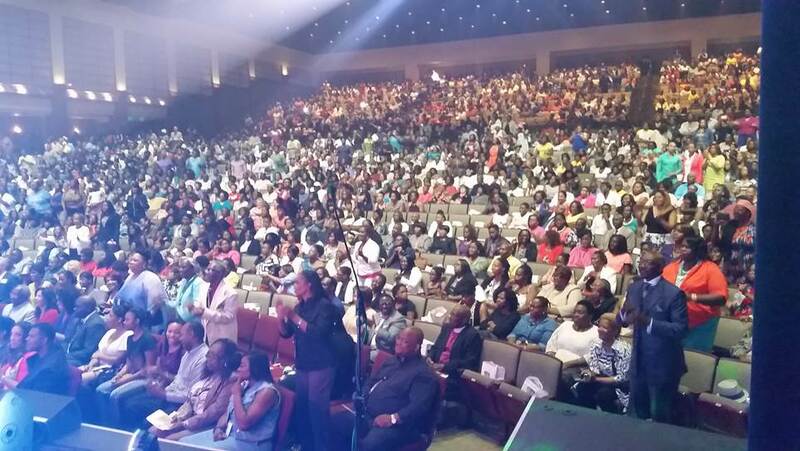 Since many of the ministers are keyboard players, and there are an estimated 1,000 churches in the greater Charleston area, the reception was quite enthusiastic, noted Eunson. Yamaha trainer merchandiser and well-known keyboard player, Ellis Jones, conducted demonstrations to introduce the revolutionary Yamaha Montage synthesizer during these Summit sessions. On Sunday, May 8, the 9th Annual McDonald’s Choir Competition Showcase was held before a sold-out audience of 3,800 people at the Charleston Convention Center. Three Yamaha Motif keyboards were onstage for all the choir competition performances. Nine finalists shared the stage with nationally known gospel artists Casey Jones and Tina Campbell, and were awarded Yamaha instruments and equipment, including a Yamaha MOXF8 keyboard, one pair of DBR-15 speakers, Stagepas portable PA system, MX61 synthesizer, Reface YC keyboard, HPH-MT7 studio headphones, and HPH-150 and HPH-100 headphones. Awards were presented by Eunson; Joseph Fox, owner, and Charles Miller, manager, of Fox Music House; and Gerald Footman, event promoter, of Footman-Brewer Enterprises. Talented local church choirs, praise and worship teams, and contemporary Christian groups submit recordings of their group’s performances several months prior to the McDonald’s Choir Showcase. An online voting and selection process – which tallied more than 23,000 votes this year – culminates in a group of finalists. 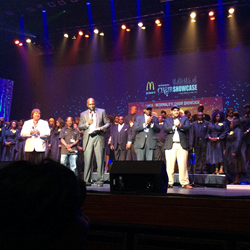 For one month prior to the McDonald’s Choir Showcase, Footman and his staff rehearse the finalists with a 14-piece band and background singers to ensure their performances are professional and polished: these winners perform before thousands of people via online exposure, media appearances and onstage performances.